This is going to be the fastest turnaround I've ever done on a giveaway, because of the timely nature of the LEGO set. 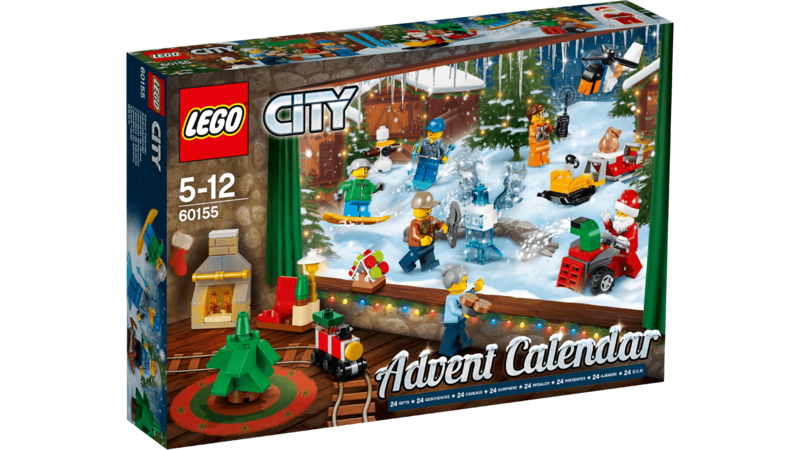 Because for December, the LEGO Set of the Month is the City Advent Calendar. 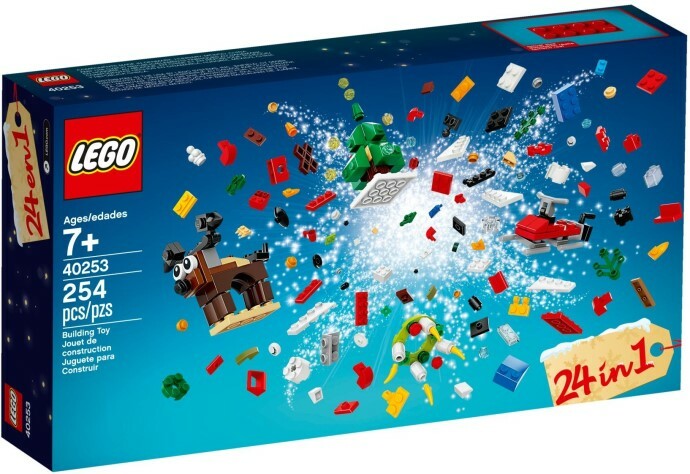 The set is actually 24 micro-builds or minifigures that celebrate the month of December leading up to Christmas. So instead of one big set, there are things like a Christmas Tree, a hearth, an ice sculpture of an Ice Demon of Vengeance angel, a helicopter drone, gingerbread house -- each build is on a minifigure scale, which means they're tiny, but impressively detailed. By the time the month is done, you'll also have Santa Claus, a kid on a sowboard, skiier, chainsaw sculptor of the aforementioned Ice Demon of Vengeance angel, and several others. I love advent calendars. My dad lived in Germany for several years, where it's more a tradition than it is in the U.S., and then I lived in Germany for a few years in the 1990s and that just reinforced my love for it. We always had an advent calendar when I was a pup, and we've done it for our own sons every year. Sometimes to excess -- I think the maximum was a year where they had four different small gifts each day. We're back down to a reasonable one per day. 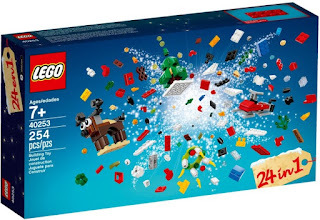 Because it's already December 1st, I'll be throwing in a bonus set that the LEGO Store had available for a limited time but you can't purchase now: a 24-in-1 set Christmas Build-Up. It has the pieces to build 24 additional small sets; the catch with that one is I think you can't build all 24 at once. You need to disassemble the peacock to build the owl, or the hot chocolate mug to build the snowplow. I think. Last year was the first time they did one of these, and this year is the first time I acquired one, AND I'M GIVING IT AWAY INSTEAD OF KEEPING IT FOR MYSELF. That's how much I love you guys. So. Because it's already like 5 AM on December 1st where I live, we'll give you a gentlemanly 27 hours to enter to win the Advent Calendar and City Buildup. 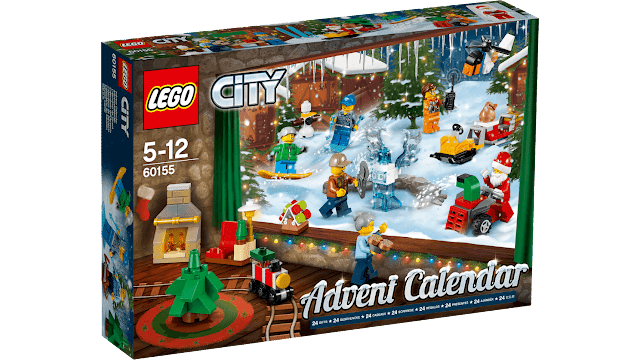 So the day you receive it, you'll get to build a few of the sets (because I didn't think ahead and do this contest last week), and then space out the rest of the sets Advent-Style leading up to Christmas. If they had similar countdowns for Hanukkah or Ramadan or other holidays/celebrations, I'd give those away. Butttttt this is what we've got. Some fine print: the LEGO Set of the Month will only be available to U.S. residents. Even though I love everyone on the planet, international shipping is beyond my reach. The drawing for the December LEGO Set of the Month will be at 9 AM MST on Saturday, December 2. The drawing will be taken from all eligible entries with a random generator. So hopefully you win. Yeah, you.